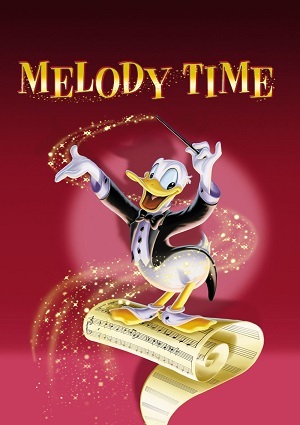 Melody Time is a cartoon comedy film developed by Walt Disney that followed the lines of Fantasia. It features several stories in the shape of segments, and each one of them tells a different tale. In Melody Time, we can find a bit of love (Once Upon a Wintertime), a story featuring a bee (Bumble Boogie), a few segments very related to the nature and the environment, and the come back of José Carioca along with Donald Duck in “Blame it on the Samba”. Also, there is a segment dedicated to Pecos Bill, a boy raised by coyotes that became the best cowboy that ever lived.